So, they're a couple, right? 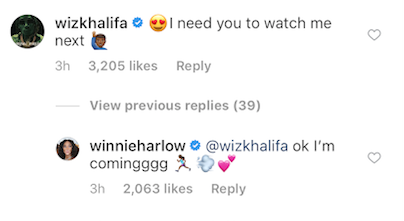 With dating rumors continuing to fly surrounding Wiz Khalifa and Winnie Harlow, the two are doing absolutely nothing to halt the talk from going on and on. While they haven't officially confirmed that they're dating, they've been spotted together on more than one occasion and Winnie was actually wearing the rapper's chain the other day. If we're not going to get answers directly from them, then their Instagram comments to each other are the next best thing. Being overly affectionate with each other online, Wiz and Winnie's friendship is either romantic or they're just playing with everybody. Whether they're just being flirty or if there's actually something going on, Wiz seems like he's definitely down to start something with the model. On her latest post of her holding a baby, the rapper slid in the comments and wrote, "I need you to watch me next." When somebody commented "wife" on her of her photos, Wiz snapped, telling the man to chill. Almost all of her recent photos have Wiz sharing heart-eyes emojis throughout the comments section, clearly showing his interest. Winnie has responded to a few but for the most part, she's playing hard to get... unless she's already been got. Winnie already got a co-sign from Amber Rose, the mother of Wiz's child, so she's definitely welcome in the family. The real question is if she's already part of the family.